← It’s Official, American Airlines has Flushed Away my AAdvantage Miles – What Airline Wants to Win my Loyalty? It was a typical sunny and slightly humid day in late August as we joined the mass of anxious parents leading our curious children to the paved area near the playground behind Springbrook Elementary School here in Naperville. Our 5th grader had come to know the routine well and said a quick goodbye as he headed off with his blossoming independence to find his class line with his new teacher at the helm holding up the “5P” sign. Our second grader was a little more bashful, more than happy to continue holding my hand tightly as he was in no hurry to make his way into the valley of tall kids. As we searched for his second grade teacher, I noticed another smiling young red-haired 2nd grade teacher named Mr. Wild welcoming children and parents like a seasoned pro. I couldn’t help but smile and wonder if this guy was even old enough to teach, but he was holding his own and seemed to be enjoying every minute. I thought to myself, if only everyone could be so blessed to have such a genuine enthusiasm to be at work. On that day, there were no news vans with towering satellite antenna sitting out front, no news cameras capturing the beginning of this important chapter in this young teacher’s life, no reporters seeking to learn more about Mr. Wild or how much fun it was to be a 2nd grade teacher with the last name “Wild”. As the school year moved into full motion, there was an almost star-struck report one day from my 5th grader with dreams of the NFL that there was a new 2nd grade teacher that had played college football for North Central and his name was Mr. Wild. I told him I thought that was pretty cool. Still, that night when I turned on the local news there was no story about a college football player from North Central who was now teaching elementary school in Naperville. Fast-forward to numerous mornings this school year and the frantic morning drop-off routine, orchestrated by the persistent vigilance of Springbrook Elementary teachers. Each morning as parents, in our daily attempt to comply with the hurry-up-and-wait procedure, we quickly get to know the teachers’ commanding presence and determined faces to get everyone into school on time, sometimes operating with the military precision of a drill Sergent. But on the mornings when Mr. Wild was on duty, he always stood out from the rest sporting a warm smile on his face and always welcoming students to school whether they were in his class or not. I can remember one morning vividly when my 2nd grader was struggling to get his heavy backpack and other belongings together to get out of the car as he spilled onto the sidewalk. There was Mr. Wild, smiling and lending a hand in helping him get his stuff together and making the situation a little bit lighter. On that morning there were no news vans, cameras or assertive reporters hanging around to capture the story of Mr. Wild who was clearly doing what he was put on this Earth to do… and that was to teach. Today, on this overcast and solemn morning, the world was moving a little slower at Springbrook Elementary School. As I pulled into the drop-off line it was very clear that Mr. Wild nor his warm smile was there to welcome our children, nor would it ever be again. I looked over to my left to discover the unwelcome sight of news vans with towering satellite antenna, cameras and reporters sitting on the street at the edge of the school campus. I thought to myself, these tragedy vultures missed the biggest story of them all, which was that day back in August when Mr. Wild brought his warm smile, genuine caring and passion for teaching to start what would have been a long and inspiring career as a teacher. On this day, I take immense pride in our courageous Springbrook Elementary teachers and staff as they managed to find a way to help our children understand on some level, doing their best to fight back their own tears in just getting through what was certainly one of the longest school days in their career. We’ve all carefully navigated our way through conversations with our children and listening very carefully to their young feelings and emotions. 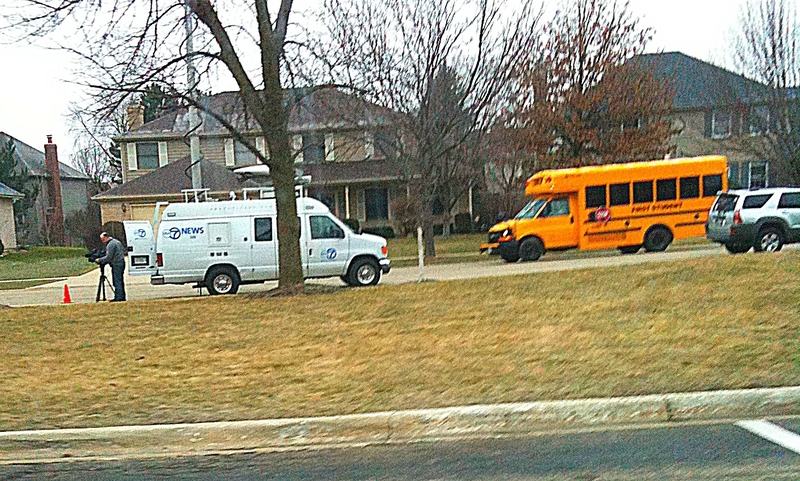 As for ABC 7 Chicago, Fox News Chicago and CBS 2 Chicago… shame on you for trespassing upon the tragedy and innocence of this morning during drop-off and this afternoon during pick-up by showing up at our school with your antennas and cameras blazing to drive home the tragedy a little deeper, leaving our children with even more questions. This morning, I feel you over-stepped any boundary you may have had and further preyed upon the innocence of our children in the wake of such a senseless tragedy by turning the cameras on them. I, and many parents I’ve spoken with, feel it was in exceedingly poor taste. Your actions have served to only further contribute to the continuing tragedy of Mr. Wild’s death. This entry was posted in Naperville Unwrapped and tagged ABC 7 Chicago, CBS 2 Chicago, Fox News Chicago, Naperville, Shaun Wild, Springbrook Elementary School. Bookmark the permalink. I just found this online…My son was lucky enough to have Mr. Wild as his teacher, and I too have thought about the first day of school so many times since Mr. Wild passed away. He seemed giddy – he just had this smile on his face that he never took off, and he was a little bouncy – nervous/happy energy, I’m sure. I’ll never forget it. The kids just adored him, and more importantly, he adored them. Even though the school year is over now, there is not a day that goes by that we don’t think about him. Over the years I have read many articles about Mr Wild….& this is the first time seeing this one. To whomever wrote it … “EPIC”! I think you so accurately captured the many emotions that were felt on the very cold, still February morning. The other teachers & parents shared hugs & tears, as we tried to find a way to explain this horrible tragedy to the kids… esp “his kids” that were 7 & 8 yrs old… then had to explain on top of that why all the news cameras were there!!! Mr. Wild, or as I the Wild family called him, Shaun Wild. I am very happy to say that he was my cousin. He lived not long but in those years he set the greatest role of all time. At his funeral Me and my cousins were told to go downstairs for the viewing of the body if we wanted too, we said no, I know that when I cry its mostly about my siblings doing something that I did not like, It was tears I rarely shed, tears of great sorrow and sadness. At the burial I set a rose on his coffin and prayed that he would go to heaven and know he is there. Shaun had a dream, to be a teacher. he lived out his dream and was a teacher. He was a teacher not to just kids, but to me, he was one of my best friends that I could tell anything to. Even though I just a 12 year old, and I didn’t know him for long he was a huge part of my life and I will forget about him. There is not one day that I don’t think about him. I will always love, grave, and miss Shaun Wild, my best friend and cousin. “Be epic”. RIP, Shaun Wild My beloved cousin.